A key interest in our group is the functional role of biodiversity: what happens to ecological functioning when biodiversity is lost? We are particularly interested in the role of phenotypic plasticity—both behavioral and morphological—in biodiversity-ecological functioning relationships (see our “behavior” research area for more). While we consider traditional “ecosystem” outcomes such as biomass production, we are also interested in “ecological” outcomes such as plant reproduction. 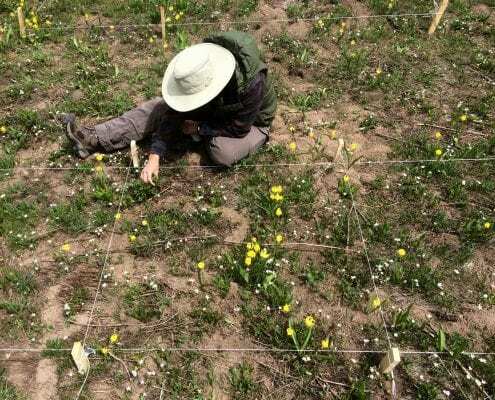 With support from the National Science Foundation, we conducted a series of single-bee-species removal experiments at the Rocky Mountain Biological Laboratory. Most theory on biodiversity-functioning relationships suggests that these relationships are saturating, such that removal of a single species is typically unlikely to affect functioning. In a series of replicated field experiments published in PNAS [link to paper], we removed six of the 11 bumble bee species in our system and showed that these removals consistently affect behavioral plastic responses of remaining bees in the system (in particular, their floral fidelity) which cascaded to functional effects on pollination, from pollen carriage and deposition, all the way through to reduced seed set in Delphinium barbeyi, whose flowers are visited by most of the bumble bees in this system. We are still analyzing results from this four-year field project. Building on the work above focused on behavioral plasticity, we are in the early stages of exploring how plant morphological plasticity in response to diversity can help to mediate functioning, in collaboration with Sonia Sultan (Wesleyan University) and others. Alva is leading working on modeling these relationships, with a focus on understanding the conditions under which morphological plasticity might strengthen vs. weaken biodiversity-ecosystem functioning relationships.